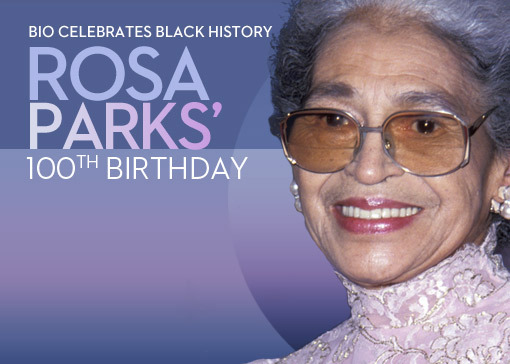 Just in time to kick off Black History Month today marks what would have been Rosa Parks‘ 100th birthday. The “Mother of the Freedom Movement” continues to inspire generations of Americans who believe in equality. Arguably the most famous woman activist in American history, Parks’ legacy lives on along side legends of the Revered Dr. Martin Luther King Jr., the Student Nonviolent Coordinating Committee (SNCC), and the National Association for the Advancement of Colored People (NAACP). 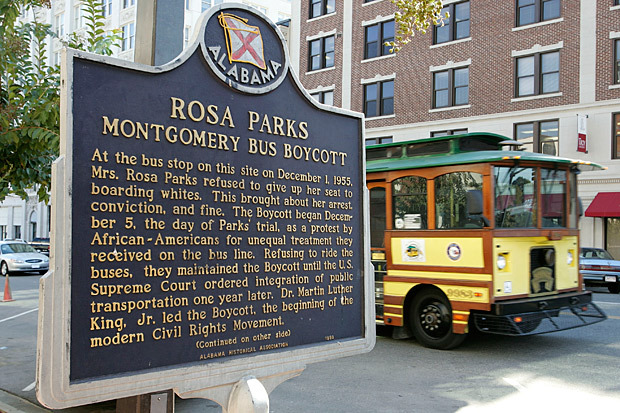 The Montgomery Bus Boycott was sparked by Parks’ refusal to obey an unjust law, and her subsequent arrest, trial and appeals lead to the Supreme Court decision upholding a federal district court ruling in the case that Alabama’s segregation laws were unlawful. 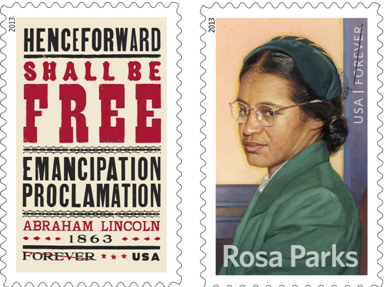 Although Parks is the most famous woman activist of the Civil Rights Movement, many women had to come together to ignite the fight for equality, including Jo Ann Robinson, Coretta Scott King, Mary Fair Burks, Josephine Baker, Mary E. King, Daisy Bates, and the women of the Women’s Political Council. Although most history books focus on the male leaders of the movement, without these and other women who dedicated their lives to the fight for equality, many of the laws we now take for granted would never have been adopted. The everyday folks in Montgomery who participated in the bus boycott day in and day out for 381 days, who walked to work through rain and cold and sweltering heat were the ones who made the boycott a success. 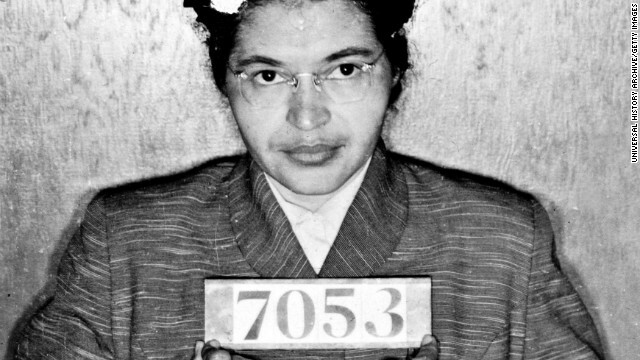 Without the cooperation of the community Rosa Parks’ determination would have been swallowed up by complacency and a resignation that the status quo would never change. It is your duty now, today, to honor Parks and other activists like her who have dedicated, and in some cases given, their lives in the fight for equality. Analyze, strategize and act to create equality. And do it with love. 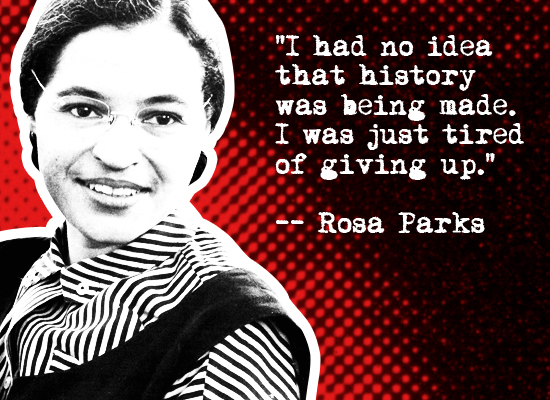 Happy Birthday Rosa Parks: You are an inspiration to us all! This entry was posted on Monday, February 4th, 2013 at 16:50	and tagged with civil disobedience, Civil rights movement, Coretta Scott King, Daisy Bates, Jo Ann Robinson, Josephine Baker, Mary E. King, Montgomery Bus Boycott, National Association for the Advancement of Colored People, Rosa Parks, Strategic nonviolent activism, Women's Political Council and posted in Race/Ethnicity and Activism, Strategic Nonviolent Action. You can follow any responses to this entry through the RSS 2.0 feed. Great positive message! This is one of those great posts that will attract others; love to share this with all my friends.